JENSEN BEACH — The National Save the Sea Turtle Foundation has donated a new sea turtle exhibit to the Environmental Studies Center in Jensen Beach. The exhibit is fabricated to highlight the biology, habits, and conservation of Florida’s sea turtles. It was originally donated to the International Game Fish Association in Fort Lauderdale, where it served as an educational display for 14 years before they closed. another facility, and covered the transportation and setup costs to install the piece at the Environmental Studies Center in Jensen Beach. National Save the Sea Turtle Foundation’s mission is to provide educational programming, promote public awareness of Florida’s marine ecosystems, and support sea turtle research both in the United States and abroad. On May 13, the Environmental Studies Council hosted an unveiling ceremony to introduce the new exhibit and thank the National Save the Sea Turtle Foundation for its generous donation that will educate the students of Martin County for years. The Environmental Studies Council, a not-for profit 501(c) 3, was established in 1978 to support, protect and enhance the unique environmental education programs of the Environmental Studies Center in Martin County. The Council promotes and extends environmental awareness through community education and outreach. For more information about the Council, visit www.escmc.org or call 772-334-4643. The new sea turtle exhibit is on display at the Environmental Studies Center. 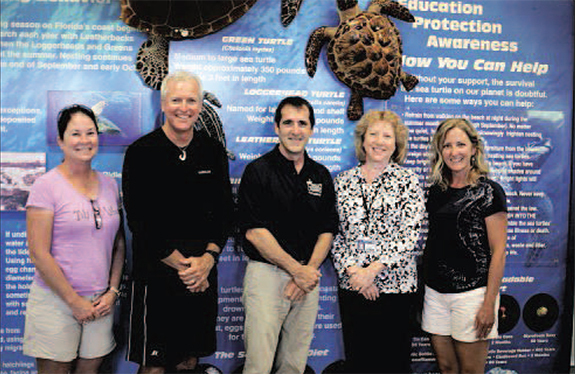 Pictured are center teachers with LarryWood from the National Save the Sea Turtle Foundation: Heather Arnold, Charlie Carr, LarryWood, Marilyn Gavitt, andMichelle Fowler.